A new low-power, high-speed memory technology on the horizon could replace solid-state drives, hard drives and DRAM in PCs, and bring higher levels of storage capacity to mobile devices and wearables. 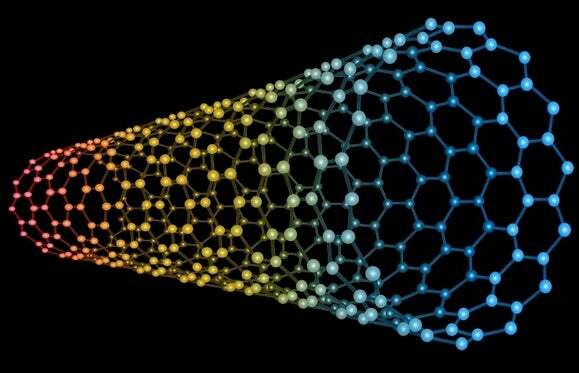 The new memory from Nantero, called NRAM (nonvolatile RAM), is based on carbon nanotubes. The memory is hundreds of times faster than flash storage used in mobile devices and SSDs, claimed Greg Schmergel, CEO of the company. Carbon nanotubes are cylinders made out of carbon atoms, with a diameter of one to two nanometers. The nanotubes are known to be stronger than steel, and better conductors of electricity than other known materials used in chips, making the technology an excellent candidate for storage and memory. Nantero’s NRAM operates at the speed of DRAM and is nonvolatile, meaning it can store data. The small size of carbon nanotubes allows more data to be crammed into tighter spaces, and the storage chips will consume significantly less power than flash storage and DRAM. That could bring more storage and longer battery life to laptops and mobile devices. The company’s NRAM is also extremely durable, Schmergel said. It was tested by Lockheed Martin and NASA on the Atlantis shuttle mission and bombarded with radiation, but the memory remained stable in extreme temperatures. Nantero, which was formed in 2001, has spent 14 years refining carbon nanotubes, which has been researched for decades by universities, the U.S. government and companies like IBM and Intel. Many top chip and device makers have shown interest in NRAM, which is now ready for manufacturing, Schmergel said. Beyond mobile devices and PCs, carbon-nanotube chips could be suitable for wearables or Internet of Things devices, which need higher-capacity internal storage. It could also be used in virtual-reality headsets and in data centers for caching or long-term storage, Schmergel said. Nantero won’t make the NRAM, but license the technology to device makers and manufacturers. The first NRAM chips will appear as DRAM-compatible modules that can be plugged directly into memory slots on motherboards. “We are designing chips that are DDR3 and DDR4 compatible, you just put in carbon-nanotube memory,” Schmergel said. Devices makers will be able to put carbon-nanotube storage on top of NAND flash circuitry so it fits in mobile devices and PCs. The technology will be compatible with storage, memory systems and protocols that exist today, Schmergel said. The NRAM chips should arrive in the next few years, Schmergel said, adding that chip and device makers are designing the memory into new products. The chips could initially be priced at a premium, but as the manufacturing volume increases, the prices will decrease. Over time, Schmergel hopes the memory will be priced competitively, or even cheaper than DRAM and NAND flash storage. Nantero unveiled long-term plans for the carbon-nanotube chips on Tuesday, when it also announced it had received US$31.5 million in additional funding from Charles River Ventures, Draper Fisher Jurvetson, Globespan Capital Partners, and Harris and Harris Group. The company has so far raised $78 million, and its advisors include Stefan Lai, a flash memory pioneer, and George Scalise, a former executive vice president at Apple. In the last two years, Nantero has made the production of NRAM chips viable by reducing the manufacturing cost tenfold. Some manufacturers worldwide will be able to make the chips using the CMOS process, though Schmergel didn’t name those companies. However, Nantero faces challenge from other emerging memory types and developments in the fast-changing computing landscape. The carbon-nanotube chips join a growing field of new memory types vying to replace DRAM and NAND flash, which analysts say could reach its last legs by 2022. As devices get smaller, it is becoming difficult to add more storage capacity while reducing the size of NAND flash chips. Possible DRAM and NAND flash replacements like RRAM (resistive RAM) and MRAM (magnetoresistive RAM) are already being used on a limited basis, and phase-change memory (PCM)—backed by IBM and Samsung—is still being refined. NRAM chips can be shrunk easily due the small size of carbon nanotubes, so the technology doesn’t face the same manufacturing challenges as other forms of memory, Schmergel said. In research, carbon nanotubes have been shown to be extremely unstable, though Schmergel is confident that Nantero’s technology could stand up to the rigors of everyday computing. Nantero found a working chemical composition for its memory by purifying carbon nanotubes in an aqueous solution after which the chips are manufactured on a silicon substrate. There are also questions around the safety of carbon nanotubes, with the U.S. Centers for Disease Control and Prevention and other researchers warning against exposure. Schmergel says Nantero is purchasing carbon nanotubes for its chips from chemical manufacturers like Thomas Swan Company in the U.K., whose material has been approved by the U.S. Environmental Protection Agency. Nantero holds more than 175 patents in the area of carbon nanotubes, and has also partnered with HP, manufacturing tools maker ASML and semiconductor companies like On Semiconductor on the research and development of the new technology.